Austin is my hometown. In 2009 I went on a food truck crawl with some girl friends and started a food/travel blog called The Trailer Food Diaries. With the momentum of the blog's popularity, I co-created The Gypsy Picnic Trailer Food Festival alongside C3 Presents in 2010 and 2011 and we had over 25k people attend with 30 trucks. Beyond that festival, I partnered with Eric Silverstein & Tony Yamanaka to curate a lasting local food truck & live music event: Trailer Food Tuesdays. Want to hire a food truck for an event? Check out who I recommend. 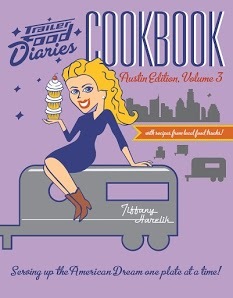 The Trailer Food Diaries Austin volumes were the first travel/food books I wrote. The tagline is Serving up the American Dream One Plate at a Time, because the foodpreneurs involved are great inspiration for anyone in any industry who wants to make their cake and eat it too. The series is dedicated to anyone who has ever taken a leap of faith - you'll want toread more to get the full scoop. Austin, Texas, is at the forefront of the richly iconic trailer food movement. These entrepreneurs have taken the age-old concept of street food and transformed it into gourmet art. Up-and-coming chefs offer their best menus out of unique trucks, cargo boxes and Airstream trailers. Some food trailers stand alone, while others are clustered in quaint trailer parks peppered throughout the city. Join Tiffany Harelik (rhymes with garlic) on a tour through Austin's trailer food scene. Meet the entrepreneurial spirits behind some of the city's favorite food trucks as they share their favorite recipes. From bacon jam to tacos and guacamole to cake balls, it will inspire any home chef to become the hero of their next dinner party and give you new favorite recipes to hand down to the next generation. Purchase the book here. Austin isn't just the live music capital of the world; it's the trailer food capital of the world too Tiffany Harelik, Austin's own Trailer Food Queen, offers a road map to exploring trailer food" within the setting of her hometown's rebel charm. Meet the chefs bringing nostalgia to the al fresco experience as they share their favorite recipes from around the globe. No matter what part of town you are in, and no matter what you are craving, these chefs have you covered with banh mi sliders, avocado sorbets, smoothies, sandwiches, supper, sweets and everything in between. Purchase the book here. In the past few years, Austin has grown--and its appetite has kept up! Tiffany Harelik, Austin's resident food truck ambassador and cookbook author, digs into her hometown's vibrant food truck scene for a third helping of local recipes. Meet the chefs behind the trucks and their sweet and savory specialties while gaining an insider's view of local recommendations. From basil spritzers and mint limeades to lomo saltado, chicken in mushroom-caper cream sauce and fried strawberries and everything in between, the recipes within are certain to inspire. Purchase the book here. Austin Chronicle: Over 100 crave-worthy recipes from Austin’s famous food trailers by Jessi Cape. "Austin food trucks have become synonymous with tasty, often ingenious, handheld edibles. 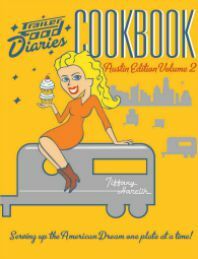 Tiffany Harelik’s ‘Trailer Food Diaries Cookbook, Austin edition, Volume 2’ (American Palate, 206 pp., $19.99) offers the inside scoop on the famous Austin trailer food that represents an American Dream. Austin Woman Magazine: Living the Food Trailer Dream. Creating an entrepreneurial pathway for aspiring chefs by Kristi Willis. Austin Man Magazine:Treasures from the Trailers. "Your favorite trailer food doesn’t have to be served to you through a window. 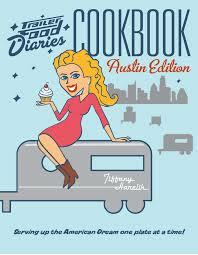 Thanks to the Austin edition of the Trailer Food Diaries Cookbook, you, too, can be slinging your favorite food truck treats from the comforts of your kitchen. No more last-minute pre-potluck runs to Torchy’s for 20 extra-trashy chicken tacos. 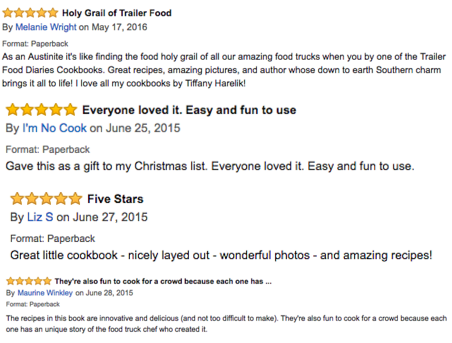 If you like the following recipes, look into Tiffany Harelik’s recipe book, now available on Amazon and Barnes and Nobles..."
Culture Map: The story behind theTrailer Food Diaries Cookbook, a tasty addition to your holiday shopping (and cooking) list. Randall Metting: Trailer Food Diaries Cookbooks: Serving up the American Dream one plate at a time! by Randall Metting. "For those who live in and around Austin – and for the many who have visited – you are, more than likely, extremely aware of the huge importance of food trailers, food trucks and the overall “mobile cuisine” movement here in the Live Music Capital of the World..."
Homemade Austin: My March with Trailer Food Diaries Cookbook, Vol. 3, Austin Edition by Krystal Mullins. "In March, I spent the entire month making recipes from Trailer Food Diaries Cookbook, Vol. 3 Austin Edition & let me tell you, it was delicious. I tried my hand at a refreshing Limeaid, decant French Toast, two quick & absolutely yummy dinners perfect for weeknights & soft coconutty goodness in the form of a cookie. Getting to know Trailer Food Diaries latest cookbook was a blast & armed me with a treasure chest of new recipes from some of my favorite Austin food trailers. I'll be coming back again & again to make my favorites & experiment with recipes that I haven't had a chance to make yet. Homemade Ravioli may just be next on my list." The Trailer Food Diaries have also been featured on: Thrillist, Examiner, Tasty Touring, The Austin Post, The Westlake Picayune and more.